PHILADELPHIA – In a landmark decision for the field of cancer immunotherapy, the U.S. Food and Drug Administration (FDA) today approved a personalized cellular therapy developed by the University of Pennsylvania and Children's Hospital of Philadelphia (CHOP) for the treatment of patients up to 25 years of age with B-cell precursor acute lymphoblastic leukemia (ALL) that is refractory or in second or later relapse. The approval was granted to Novartis for the chimeric antigen receptor (CAR) T-cell therapy, Kymriah™ (tisagenlecleucel, formerly CTL019). In 2012, Penn and Novartis entered into a global collaboration to further research, develop and commercialize Kymriah and other CAR-T cell therapies for the treatment of cancers. Kymriah is the first therapy based on gene transfer approved by the FDA. Investigators at Penn's Perelman School of Medicine and CHOP, who together led research, development, and clinical trials of the new therapy in collaboration with Novartis, hailed the FDA's approval as a game changer for the treatment of younger patients battling the aggressive blood cancer and a pivotal milestone in this new era of cellular therapies that treat cancer with a patient's own immune system. "This is a turning point in the fight against B-cell ALL that opens up opportunities for patients across the world who desperately need new options," said Carl June, MD, the Richard W. Vague Professor in Immunotherapy in the department of Pathology and Laboratory Medicine in Penn's Perelman School of Medicine and director of the Center for Cellular Immunotherapies in the Abramson Cancer Center. "We're excited and proud to have moved this CAR therapy, in collaboration with Novartis and CHOP, through all phases of development and clinical trials, established its efficacy, and now extended its reach to children across the country under this FDA approval," he added. "We hope the momentum behind the technology builds as we continue to investigate the abilities of personalized cellular therapeutics in blood cancers and solid tumors to help patients with many other types of cancer." Kymriah is expected to be available through a network of certified treatment centers throughout the United States. "We delivered engineered T-cell therapy at CHOP for the first pediatric patient in the world, Emily Whitehead, who was only six years old when her leukemia stopped responding to conventional treatments. Emily's cancer remains in remission, and in larger trials, we're seeing overall remission rates over 80 percent, which is a remarkable improvement upon previous treatment success rates," said lead investigator of the CHOP and global trials of the therapy, Stephan Grupp, MD, PhD, the Yetta Deitch Novotny Professor of Pediatrics at Penn and director of the Cancer Immunotherapy Frontier Program and chief of the section of Cell Therapy and Transplant at CHOP. 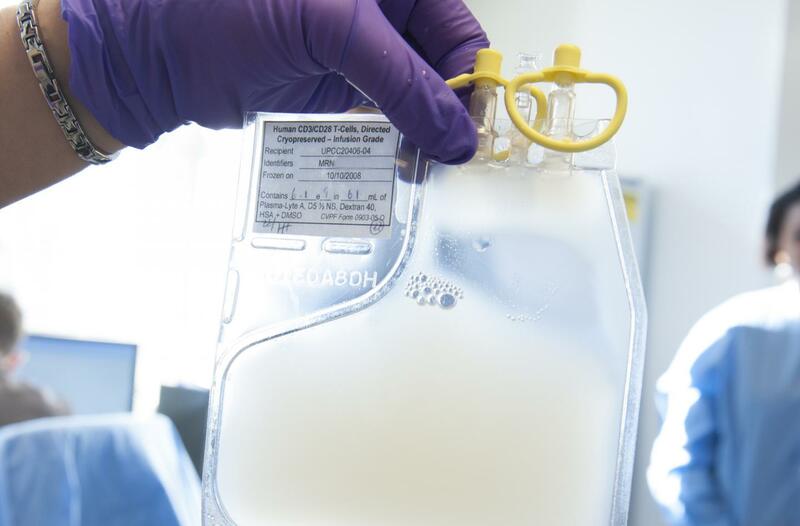 The new treatment modifies patients' own immune T cells, which are collected and reprogrammed at the Novartis manufacturing facility to potentially seek and destroy the patients' leukemia cells. After being infused back into patients' bodies, these newly built "hunter" cells both multiply and attack, targeting cells that express a protein called CD19. Tests reveal that the army of hunter cells can grow to more than 10,000 new cells for each single engineered cell patients receive, producing high remission rates in completely refractory leukemia – and can survive in the body for years. "This transformational therapy for patients is the result of true collaboration between industry, academia, healthcare professionals, patients and caregivers" said Bruno Strigini, CEO, Novartis Oncology. "We thank all those involved in this historic FDA approval, which provides renewed hope to children and young adults who have had limited treatment options thus far." CTL019 was first tested at Penn in 2010, in adult patients with advanced chronic lymphocytic leukemia (CLL). In 2012, CHOP became the first institution to investigate Kymriah in pediatric patients with ALL, the most common childhood cancer. About 20 percent of the 3,500 pediatric and young adult patients diagnosed every year with ALL in the United States relapse or do not respond to conventional treatment. Those early-stage clinical trials, in which more than 90 percent of patients achieved a complete remission one month after receiving the therapy, led to a global registration trial in 2015, involving 68 children and young adults with advanced ALL treated at 25 centers across the world. Eighty-three percent of the patients who received a single dose of their own engineered cells achieved a complete remission. In July 2017, an FDA advisory panel unanimously recommended approval of the therapy, paving the way for today's FDA approval. After presentation of trial data and testimony from families whose children have received the therapy, one expert on the panel said this was "the most exciting thing I've seen in my lifetime." Many patients in the ALL trials experienced a side effect called cytokine release syndrome (CRS) including grade 3 or grade 4, which includes varying degrees of flu-like symptoms, with high fevers, nausea, and muscle pain, and temporary neurologic symptoms, including delirium, but also low blood pressure and breathing difficulties requiring ICU-level care in the most severe cases. Eighteen percent of patients experienced grade 3 or grade 4 neurologic events. Patients were treated with the immunosuppressant drug tocilizumab or short courses of steroids to combat the symptoms. Novartis will create a registry to follow patients for 15 years after being treated to monitor their progress and any potential, future side effects. Other trials with CTL019 therapy are also underway in the Abramson Cancer Center for adult ALL patients and those with CLL and non-Hodgkin lymphoma. Penn and Novartis are also investigating the next generation of CAR therapies for multiple myeloma, and for solid tumors, through trials in glioblastoma, mesothelioma, and ovarian and pancreatic cancer. Other CAR trials at Penn are exploring the technique for prostate cancer, melanoma, and triple-negative breast cancer. The Novartis-Penn Center for Advanced Cellular Therapeutics (CACT) opened in 2016 and hosted Vice President Joe Biden at the launch of his Cancer Moonshot initiative, cementing Penn's role as an international innovator in the development and manufacturing of personalized cellular therapies. Additional leaders of the research include Penn's David Porter, MD, the Jodi Fisher Horowitz Professor in Leukemia Care Excellence and director of Blood and Marrow Transplantation in the ACC; Noelle Frey, MD, MSCE, an assistant professor of Hematology-Oncology; Bruce Levine, PhD, the Barbara and Edward Netter Professor in Cancer Gene Therapy in the department of Pathology and Laboratory Medicine; Michael Milone, MD, PhD, an associate professor of Pathology and Laboratory Medicine; and CHOP pediatric oncologist Shannon Maude, MD, PhD, an assistant professor of Pediatrics. Adult patients who are interested in T cell therapies at Penn Medicine can call 215-316-5127 for more information. For information about the Cancer Immunotherapy Program at CHOP, please call 267-426-0762. Editor's Note: The University of Pennsylvania has licensed some technologies involved in these studies to Novartis. Some of the scientists involved in these trials are inventors of these technologies. As a result of the licensing relationship with Novartis, the University of Pennsylvania receives significant financial benefit, and some of these inventors have benefitted financially and/or may benefit financially in the future. The University of Pennsylvania Health System's patient care facilities include: The Hospital of the University of Pennsylvania and Penn Presbyterian Medical Center — which are recognized as one of the nation's top "Honor Roll" hospitals by U.S. News & World Report — Chester County Hospital; Lancaster General Health; Penn Wissahickon Hospice; and Pennsylvania Hospital — the nation's first hospital, founded in 1751. Additional affiliated inpatient care facilities and services throughout the Philadelphia region include Good Shepherd Penn Partners, a partnership between Good Shepherd Rehabilitation Network and Penn Medicine.